Being possibly the biggest icon in all the world, its advisable to explore other forms of media. 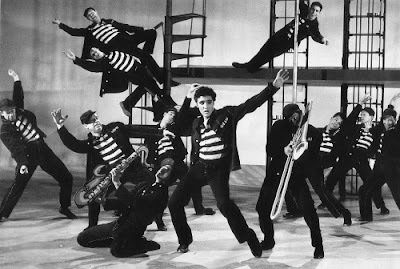 In addition to being 'The King of Rock and Roll' Elvis Presley of course became a pretty notable film star, what is usually considered his best effort is this film, 'Jailhouse Rock' , in which Elvis no sells police brutality, and sings,naturally. Vince Everett (Elvis Presley) is a young man who is imprisoned for manslaughter after a bar fight gone wrong, During his stint in the big house, Vince slowly gains notoriety as singer and begins his path to super stardom. I have never really seen much of Elvis' work as an actor and whatever I have seen was a long time ago, Today I picked up this film on Blu-Ray, I was mostly expecting elaborate and spellbinding musical sequences but to surprise it was more of a character study than a musical, and an enjoyable yet tragic one at that. The film does feature some great music sequences though, this is a given when the film stars Elvis, the famous 'Jailhouse Rock' scene featuring the simplistic yet fantastic set design is still an entertaining and effective scene. The choreography and photography is all top notch. The script though is filled with plot holes and implausible situations, but this is a moot point seeing as its a vehicle for Elvis Presley. This is basically Elvis' film and all conversations regarding 'Jailhouse Rock' will always lead back to him, all though he gained some criticism for not being the greatest of actors,His performance here is fine, hes natural charisma shines through and his presence on screen is undeniable, he does seem to have troubles with dramatic moments though that seem a little over the top, and as I mentioned above, he completely no sells a police whipping in the jail. The rest of the cast is good, especially Judy Tyler, who tragically passed away three days after the completion of filming in a car accident. 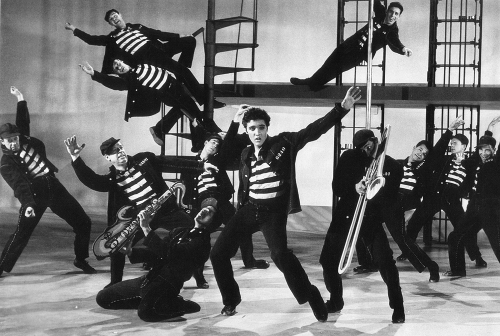 'Jailhouse Rock' is definitely an enjoyable experience, its far from perfect though and there are some ridiculous moments,even for the times, but its hard not to have a good time with this film. Elvis was truly one in a million.